Nassau County Executive Edward P. Mangano and County Legislator Rose Walker recognized Tim Parker, a Hicksville High School Graduate, for being drafted to play professional soccer for the Vancouver Whitecaps. 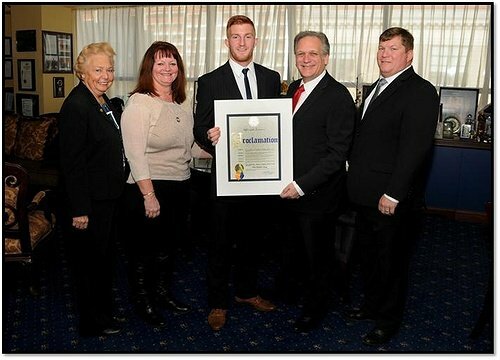 Hicksville, NY - January 20, 2015 - Nassau County Executive Edward P. Mangano and County Legislator Rose Walker recognized Tim Parker, a Hicksville High School Graduate, for being drafted to play professional soccer for the Vancouver Whitecaps. Tim, captain of the St. John’s Red Storm soccer team in his senior season, was selected as the 13th overall pick in the 2015 Major League Soccer Draft. Tim was the first St. John’s player ever to be picked in the first round of the Major League Soccer (MLS) SuperDraft and is the highest Red Storm selection since 2004. Tim earned first team Big East honors in each of his four seasons at St. John's and his leadership and poise on the defensive end gave the Johnnies an opportunity to play in three straight NCAA Tournaments from 2011 to 2013. He also helped lead the team to a Big East Tournament Championship in 2011. Sports professionals consider Tim to be one of the best soccer players in North America today and the Whitecaps will certainly benefit from his youth, athleticism and leadership skills. Pictured with County Executive Mangano are: Nassau County Legislator Rose Walker; Mr. & Mrs. Parker and Tim Parker. Subject: LongIsland.com - Your Name sent you Article details of "Mangano Recognizes Local Athlete Drafted Into Major League Soccer"